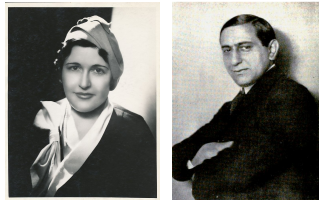 The eyes of the American film industry have been focused on Ernst Lubitsch, the young German director, who more than any other foreign maker of pictures has established himself as a man of international reputation. From the moment Mr. Lubitsch stepped off the American steamship from Bremen he has been followed by newspaper reporters and film men, who have lingered to hear from his own lips the question of his success. Unless they speak German or have an interpreter, they will fare very badly, because Mr. Lubitsch speaks no English. His German is spun off so quickly, the German one learned at school is absolutely of no use, except to catch an occasional phrase. I met Mr. Lubitsch in the offices of the United Plays. Offices that looked more as if they might have belonged to the suite of a grand duchess or a member of the reigning family. Whoever thought to find a grand piano with a cerise-colored drape, with curtains and heavy carpets to match, marblestatuary, pictures and other visible semblance of elegance on Broadway? I rubbed my eyes to see if I had not suddenly stepped into an Arabian Nights chapter instead of in a business office. But no, apparently business istransacted in these luxurious offices. Then Mr. Lubitsch came and I forgot the background in my interest in the young German, who is about 29 years old and has a smile that is infectious. He was dressed in a light-colored suit, apparently ready-made, and only a distant cousin to the producer that comes from our Fifth avenue tailors, but his clothes were only incidental. He started speaking German at a rate of forty miles a moment, asking me long questions, and punctuating each remark with a flourish of his arms. "Please translate," I asked Mr. Blumenthal. "He is speaking so fast I cannot catch a word he is saying." And so Ben Blumenthal stepped into the breach and followed Mr. Lubitsch with a literal translation. I did manage to understand before Mr. Blumenthal started his interpretation that Mr. Lubitsch believes our American films are "sehr gut." "Take 'Forbidden Fruit' as an example, the little things (Mr. Lubitsch meant the details) are amazing. I noticed a girl troubled over the proper fork to use. She stopped short at her fish fork and waited for her hostess to proceed so she would make no mistake. Such care for the minor things is wonderful and is typical of the excellence of American direction." Mr. Lubitsch spoke of "Broken Blossoms" as being very popular in Germany. "It is so beautiful," he said, "so artistic. Mr. Griffith is a wonderful director to be able to put such beauty on the screen." Through Mr. Blumenthal's apt interpretation I gathered that things had not been so rosy in making "Pharoh's Wife" as Mr. Lubitsch had expected. A little of the spirit of American unrest crept into the studio. "Pharoh'sWife," which Lubitsch made for Famous Players-Lasky, is an Egyptian story, a mammoth spectacle in which 25,000 men and women are employed. A great battle was in progress when one side of the army suddenly stopped work and refused to go on with the picture. "What is the trouble?" demanded Lubitsch. "More money--money like the Americans get," was the cry. This faction had no more been quieted with bigger salaries than the other side of the army stopped short and staged a little strike of its own. Both armies quieted, the picture progressed until the entire outfit put their heads together and with due accord furnished a strike that took the entire studio force to quiet. "Pharaoh's Wife" will not be the cheap picture every one expected. Its cost is on a par with any spectacle made in America. And it seems likely, now that the Germans have learned not to work for nothing, that pictures made on Teutonic ground will hereafter rank in price with our American-made product. Mr. Lubitsch was taken on a tour of inspection of the American motion picture theatre. He saw the Capitol, the Strand, the Rivoli and the Rialto. "They are very beautiful," he said. "Much more pretentious than anything we have in Berlin. Our theatres have no such elaborate programs and are not designed with so much thought and care. They are but simple playhouses compared with these theatres." In fact Mr. Lubitsch is the sort of young man who is prepared to give his unqualified endorsement to anything American. He is very good-natured: smiles continually. He has a personality that is both gracious and pleasing. He says he likes Charlie Chaplin better than any actor he has ever seen and the last time a Chaplin picture played in Berlin he went three times. Harold Lloyd is also a great favorite of Mr. Lubitsch. He thinks he is one of our best actors. Perhaps one reason for his interest in our comedians is the fact he started in life playing comedy roles. It was Max Reinhardt who discovered him and engaged him for his own theatres. His success was rapid and he toured Europe with the Reinhardt company. At the time when Lubitsch had made a place for himself on the European stage Paul Davidson, owner of numerous German film undertakings, saw him acting the leading role of the devil in "The Green Flute." Impressed by the young man's talent, Mr. Davidson talked films to the young actor, and a contract was signed making young Lubitsch director and scenario writer, as well as actor of his own company. His first undertaking was "Lubitsch Comedies." It was not until after that he became identified with bigger features, but it is as an historical director that he has become recognized in this country. It was he who discovered Pola Negri, who was at that time an unknown cabaret singer. Her charm and her talent, combined with his directorial skill, made "Carmen or Gypsy Blood" one of the best-known pictures in the world market. Then followed "Passion,""Deception," and "One Arabian Night." Mr. Lubitsch was highly amused at the questions asked about the papier-mache sets, which we have been told are a part of his historical settings. He laughed merrily and said he had never heard of them. "Pharaoh's Wife" took six months to produce, but it took a very short time to cut and edit. Mr. Lubitsch does his own cutting and editing and believes no director should entrust this work to any one else, whether he is German, American or English. After a brief visit here he will go West to look over the studios in California. He is in favor of our directors visiting Germany and European directors visiting America for an exchange of ideas. Although his first picture was for an American concern and belongs to Famous Players-Lasky, we understand there are many film offers being made in his direction. Good directors are scarce. He said as I was leaving to make room for several other newspaper folk who were waiting, "Next time we meet I shall try and learn English." He said most of the sentence in good English, which makes me wonder if he doesn't know more English than he pretends. Foreigners are always such expert linguists. As for Pola Negri, he says she is everything charming a woman should be, and it is unnecessary for him to say more because she will visit America early next year. This was said in German, with a twinkle in his eye. In fact we suspect the young man of having a great sense of humor. He laughed so frequently and with such enjoyment.